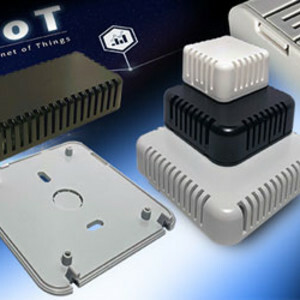 The 1551V miniature ventilated sensor enclosures from Hammond Electronics are designed to house sensors and small subsystems installed in the manufacturing environment as part of IoT systems. While there is no relevant international standard, the 1551V enclosures are designed around the PCB sizes selected by leading sensor manufacturers for their latest generations of products. The ABS UL94-HB 1551V is available in black, grey and white. Four plan sizes — 80 x 80, 80 x 40, 60 x 60 and 40 x 40 mm — are all 20 mm high. Maximum PCB sizes are 58 x 49, 58 x 23, 38 x 29 and 23 x 23 mm respectively. Four PCB mounts are moulded into the base and the 20 mm height gives enough space for board-mounted RJ45, USB and other standard communication interfaces. To simplify access, the snap-fit closure allows repeated opening and closing without tools. There are ventilation slots on all four vertical faces and mounting slots and a 15 mm cable knock out in the base. Environmental sensors monitoring basics such as temperature, humidity and pressure are widely installed, and are now increasingly intelligent subsystems, with data processing and communications capability embedded on a small PCB. For active components that produce relatively large amounts of waste heat, the product obviously provides good airflow for cooling purposes. 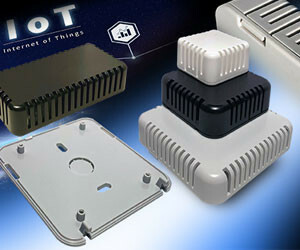 I am interested in Hammond Electronics 1551V sensor enclosures for the IoT .